Someone wants dermatologist Rachel Grant’s latest research, and they’ll do anything to get it. Including trashing the plants needed for her breakthrough scar-reducing cream–and trying to run Rachel down. Desperate for help, she turns to Edward Villa, the only man she trusts. But the greenhouse owner knows too much about Rachel’s research, and now he’s a target, too. Break-ins, muggings, murder…the would-be thief is getting desperate–and getting closer. Edward vows to protect Rachel at all costs. Yet with time ticking away, Edward knows they have to uncover the madman shadowing Rachel before their chance for a future is destroyed. I’ve been reading a lot of fantasy and dystopia lately so I decided to take a bit of a break and go for a light and fluffy book just to cleanse the palate. I recently got Camy Tang‘s Formula for Danger through my Kindle, and I missed reading Camy’s work, so I thought this would be a perfect in-between book. Well, I think I may have chosen the wrong book! 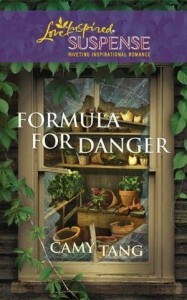 I’m not saying that because it’s a bad book, but because Formula for Danger is anything but fluffy. Of course, I should have picked up from the title already, but who knew this book would be such a non-stop suspense ride all the way to the end? Formula for Danger wastes no time with the action as I was dropped immediately in the middle of it right from the start. Rachel Grant, the protagonist, is assaulted just as she goes out of her lab at the family owned Joy Luck Spa. From here bad luck just seemed to follow Rachel, but this luck is not coincidental but planned as someone really wants her dead! Every chapter in Formula for Danger is brimming with suspense and action, and I found myself getting breathless as every threat comes to Rachel’s (and the love interest, Edward’s) life. It was easy to immerse myself into the Grants’ world again as I’m already familiar with it after reading Deadly Intent, the story of Rachel’s sister, Naomi. This isn’t really a sequel, so you don’t have to read the first book before reading this, although I feel like it may be helpful. Formula for Danger brings in the action quick that there is no time to really get to know and appreciate Rachel’s family with all that’s happening in the novel. Perhaps it was just me, since I haven’t read books in this genre for a while, so I felt like I would be a bit frustrated with reading this and diving right into the action without pausing long enough to know about the surroundings. The threat in Rachel’s life felt very real, and the suspense in finding out who the culprit was drawn out for so long that I found myself wondering the same thing that the main characters did: when will it end? However, I wasn’t really that surprised when the reveal was made and I’m not sure if it’s because I figured it out beforehand or because it’s really just not that surprising. Compared to Deadly Intent, there seemed to be less red herrings thrown here, so the mystery seemed a bit linear, and the chase to save Rachel’s life took a higher precedence compared to finding out who was behind everything. I haven’t encountered a Christian romantic suspense novel before! I can’t remember the title of the last Christian romance I read (only that it had a frontier setting and mail-order brides) but it really made me curious to see how many more were out there. Thanks for sharing this with us!